A F E R R Y ? C U S T O M B U I L T ???? It might be of interest to remember that Montserrat’s development was through air travel, not through travel by sea. In addition to this we had high calibre, dedicated, civil servants who, in spite of personal political preferences performed in such a manner that in the 1980’s these hard working government employees brought us out of “Grant In Aid”. People like Rt. Hon Austin Bramble “set the stage” and Hon John A Osborne “put on the show”, but the actors/players were our civil servants. Would that we had some of these stalwarts today! In the late 1970’s/1980’s market forces like The American University of The Caribbean, Air Studios, Radio Antilles, our Residential Tourists, and Day Tours by air, contributed greatly to our development. We also had cruise ships calling at Port Plymouth. Our population was in excess of 11,000. We were at the peak of our economic achievement, and had recently relieved ourselves of “Grant-in-Aid”. We were becoming affluent. There was never a passenger ferry or scheduled travel by sea. (Remember the days of the Federal Palm and Maple in the late 60s)? Let us not forget that during this period GOM formed a company called Montserrat Aviation Services Ltd. for the purpose of managing a twin otter which HMG had given to us. (yes given to us.) “On 22 January 1981 a brand new twin otter was delivered to The Government of Montserrat” V2 -LDD. Our own aircraft. We had previously been given a Trislander by HMG in 1979, but that did not serve our needs. She was also brand new VP-LMB, and was replaced by our twin otter. other aspects, including scheduling and of course paying LIAT for the services which they provided . We had not been satisfied with the schedules which LIAT had been providing us. One avro in the morning and a second in the evening. Hence the need for our own aircraft which allowed us to fix the schedule to Montserrat and satisfy our residents. (schedule below). We did eight (8) return flights daily with this twin otter and served the then population of 11000+. certain days a week. There was never any need (“want”) for a ferry. There was also Carib Aviation Charter Company in Antigua for those who wished .According to Carib at the time “Our primary goal is to try to take away the hassle of travel by giving you the VIP services you deserve. This means no more wasted time in airports waiting to connect with sheduled services”. Carib Aviation’s Red Tail Magazine 2000. Montserrat’s first landing strip and first airport, Blackburne Airport are featured in this magazine. management need certain expertise. LIAT sold her in June 1986. She was again sold to SONAIR and is still flying as D2-EVA according to reports received. We continue to have access problems after eleven (11) years of having the John A Osborne (aka Geralds) Airport and advice from HM Government on type of aircraft for which the airport was constructed. Sea transportation was essential during the early days of the volcanic crisis. Some means used at that time were highly unsuitable. HMG finally provided us with a most comfortable ferry in the form of the Opal Express and sometimes her sister ship,for transportation between Montserrat and Antigua. Ferry service, according to, An Alternative Organizational Model For Managing Air And Sea Access to Montserrat, was not intended to become commercially viable and no effort was made to develop the market in Antigua or elsewhere. The ferry ran at 11% average occupancy through it’s life until withdrawn from service in July 2005. Win Air Twin otter air services commenced on 11th July of the same year. We had no scheduled transportation by sea until the temporary ferry MV De Luxe in December 2009. During the time of “Opal Express” a Montserratian who had relocated to Antigua saw an opportunity and grasped it by sending day tour visitors to Montserrat. This came to an end with the opening of John A Osborne Airport in July 2005, and the discontinuation of the emergency ferry service. 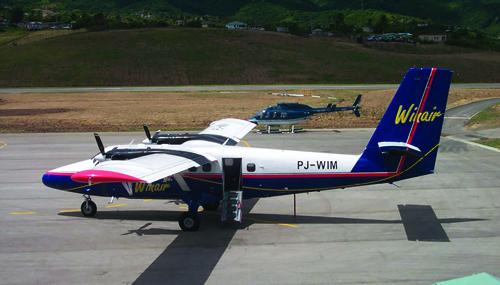 WINAIR was flying with no subsidy at fares approved by GOM (normal airline operational requirement).These fares could not compete with the previously subsidized ferry fare of EC$150 – $200.00 and day tours came to an end much to the frustration of taxi drivers and eating places on the island. five of them in all”. support this project. Air was still our only means of scheduled transportation. Montserrat on day tours. Montserrat Reporter March 02, 2007… “the CM went on to say: “we are negotiating with private sector individuals to restart the ferry service and it would be nice for those ferry services individuals to have a dedicated dock in Antigua next to the cruise ships, next to the visitors who would want to come to Montserrat”. Hence the birth of the idea for a private sector ferry for day tours from Antigua. These hopes were over ambitious and naive (Antigua is very protective of its market share), and to date have not materialised. Written reports almost always mention ferries and day tours together. Montserrat Reporter March 02, 2007. – “CM Lewis “Government cannot enter into providing ferry service again, we don’t have the resources to do so but any private sector individual out there proposing or able to start a service we are inviting them to come with us and tell us what kind of support they need”. In 2007 C.M Lewis began talks of the possible return of a scheduled ferry service. Montserrat Reporter March 02, 2007 headlines “Ferry Service Plans Get Well Under Way”. There was still ferry transportation only on a charter basis at certain times of year. In September 2009 WINAIR offered a Day Tour rate by air of US$99.80. Montserrat Tourist Board 24 September 2009. “Re Special Day Trip Fare From WINAIR for Bona Fide Day Tour Operators”. Selling this was too cumbersome, indicating the lack of knowledge in this field by the Tourist Board who were trying to bring back day tours. December 2009, we had ferries only at peak times and these were chartered. Travel into and out of Montserrat was done by air. 09 November 2009 Government of Montserrat. “MONTSERRAT MOVES TO A LONG TERM FERRY SOLUTION”. Sailing under the name FJORTOFT a new ferry that will be jointly owned by the Government of Montserrat, the Government of Antigua and the Barbuda Island Council is a 101-seater vessel capable of 28 knots” “The ferry has the potential to move up to 400 persons per week on regular scheduled service, a number that translates into over 20,000 persons per year”. This ferry venture we understand has cost GOM in excess 0f EC$500 000 and was to have been operated by Twin Island Ferries. Where is it now? It was stated as new and was to have commenced operation in January 2010.How many services has it done between Montserrat and Antigua? take responsibility for such vital infrastructure” An Alternative Organisational Model For Managing Air And Sea Access to Montserrat. Is there any change in this situation after eleven years? WINAIR’s contract was not renewed in 2008. We suffered a disastrous short period with LIAT/Carib Aviation “code share” which lasted only twelve (12) weeks. WINAIR was asked to return, which they did but only with subsidy. Hence the beginning of subsidy on the Montserrat/Antigua air route. I was surprised to hear on radio that Montserratians would not travel by air to Antigua even if the air fare was equivalent to the ferry fare and there were twenty (20) services a day. places in the world, where you can no longer do this. People want to sit at home and plan their holiday without much effort and Montserrat is not in international flight systems”. Certain airlines have this capability. Montserrat enjoyed this type of reservation system in the past. Saba enjoys this through WINAIR booking system and have approximately 900 tourists by plane monthly. (Saba’s Tourism Figures June 03, 2014). Their runway is shorter than that of John A Osborne airport. So many consultancies but no one understands or follows the recommendations. A “custom built ferry” might be needed when Plymouth can be advertised to the world. It may not be too soon for thoughts to be spent on the future of Plymouth. 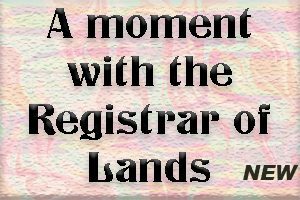 What will be the rights of those who own property there? And when will we be able to get a definitive answer from the insurance companies with regard to continued cover for vehicles and their sightseeing passengers who go in there. The question is, are they covered by the mandatory third party insurance when in Plymouth with permission for sightseeing? How would our “custom-built ferry” be used in Guadeloupe and Nevis/St. Kitts. Places where there are several locally owned ferries? Would we operate day tours with a virtual “dead leg” going in and also one on the return after having taken our day tours back. How would the ferry be positioned? One wonders what reasons would lead British employees to deliberately ignore the US$18,000,000 + spent on an airport and begin a refrain about a “custom-built ferry” that they were well aware would not improve our access situation. Will we always have nine-seater airline companies plus a ferry for access? And were “Poverty Barons” involved in continuing ferry services here instead of working towards a suitable police launch to protect our waters and support our airport? Perhaps we should take a serious look at Saba’s air services. It would appear that this vexed question of access for Montserrat needs the wisdom of the biblical Solomon.